Sweet Solutions | Where Does Your Website Live? If you want a website, you need to sign up with a hosting service. A hosting service provides the space on the Internet where your website will live. My website currently resides on a shared server at InMotion. 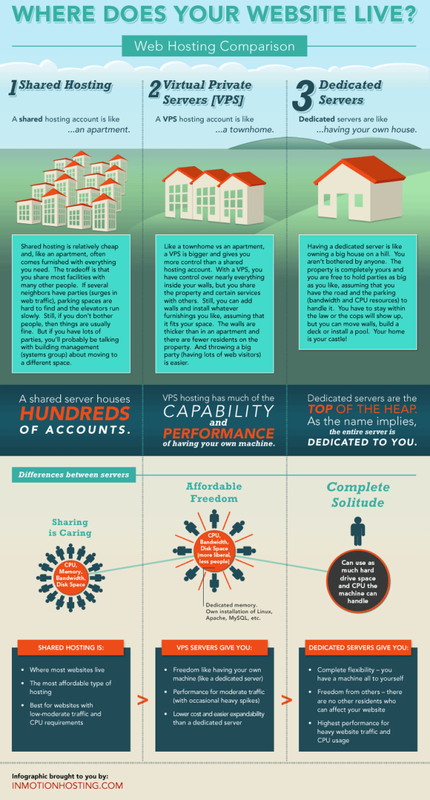 Most people go with shared hosting. It’s generally the least expensive option and perfectly adequate for websites, like mine, that don’t experience heavy traffic. If your website gets a lot of hits every day, with an occasional spike or two, a VPS (Virtual Private Server) would be a better choice. Dedicated servers are for the uber popular sites where everybody is trying to access something on the site at the same time.